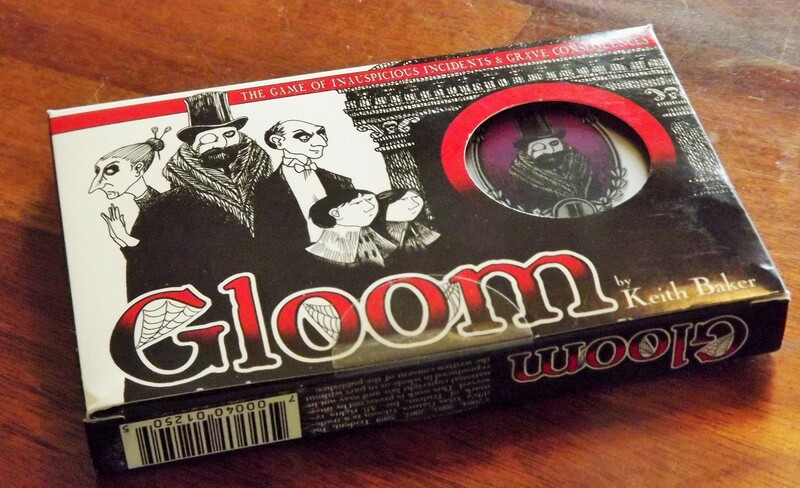 In Gloom, you are the hand of fate manipulating your chosen family! It is up to you to create a narrative around them and conspire to dash any dreams they may have of success and happiness. Actually, happiness is the worst thing that can happen to them. Gloom is a story telling game for 2-4 people. To begin, you choose your ill fated family and take the 5 cards representing each individual member. For a shorter version, you can choose 4 of the characters instead. You then draw your starting hand of 5 cards from the draw pile. Who wouldn’t want to be part of this family? Your turn consists of two plays. First, you either play or discard any card from your hand. The card you play can include an untimely death card, which will kill off a member of your family with a negative point value. The next card you play can be anything except an untimely death card. You can also choose to discard at this time. Then you draw your hand up to your current card limit. There are modifiers that can alter your hand limit, so you need to pay attention to any that you may have on the table. You are also allowed to pass at any point during your turn. The cards are transparent so that the symbols and the point values can overlap and be obscured or show through. As you play your cards on top of one another, the modifiers, symbols and points can change, so it is a good idea to look at your cards while planning your next move. The cards also give you “story prompts” and you must create your tale around these prompts in order to play the card. The goal of the game is to play cards on your characters to make them as unhappy as possible, while simultaneously playing cards on your opponent’s characters to bring them joy and good fortune. Once your characters are miserable (have a negative point value) you can start killing them off. The first person to kill off all of their characters ends the game. Players then total up all of their deceased character’s points and the player with the lowest total wins! Any character that hasn’t died, doesn’t count towards your final total. While it is not impossible to win without killing off your characters, it is difficult. The family is just about ready to start being killed off! 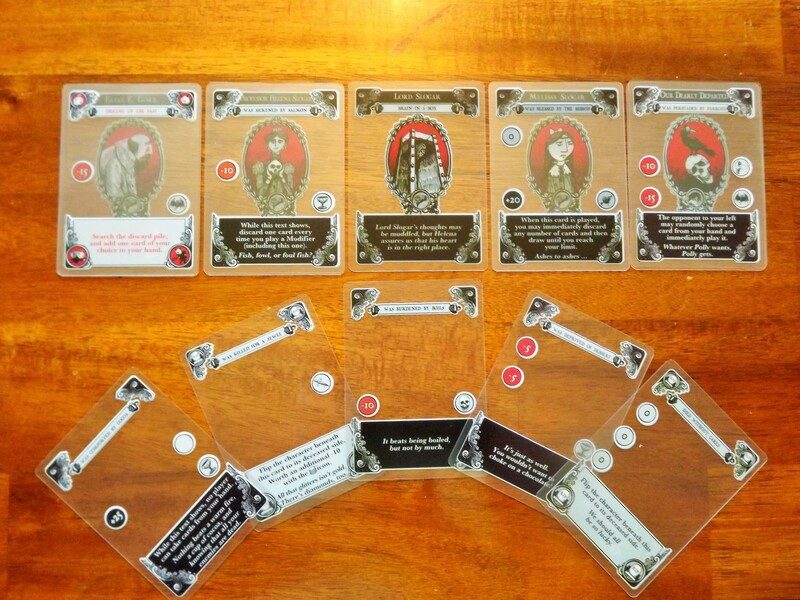 This Gothic card game is thematically spectacular, and it’s gloominess creates a truly wonderful experience. It has straightforward rules that are easy to learn and teach, and it’s appearance is amazing combined with a unique mechanic. If you like dark, macabre humour you will enjoy this game. The game play is perfect for what it does and it isn’t overly complicated. I think that if it were, it would detract from the player’s ability to be creative. It is difficult to form a story if you are constantly worrying about the rules. The cards and their placement are used simply as a vehicle for the story telling. You don’t just play the events on the cards, you must tell a story using them. The cards provide a starting point and you must provide the details leading up to that event. I had a card come up that said that the character was to be “taunted by tigers”, and I had to weave that into the story line I currently had going. It was difficult as the particular character I wanted to play the card on was on a train at the time! 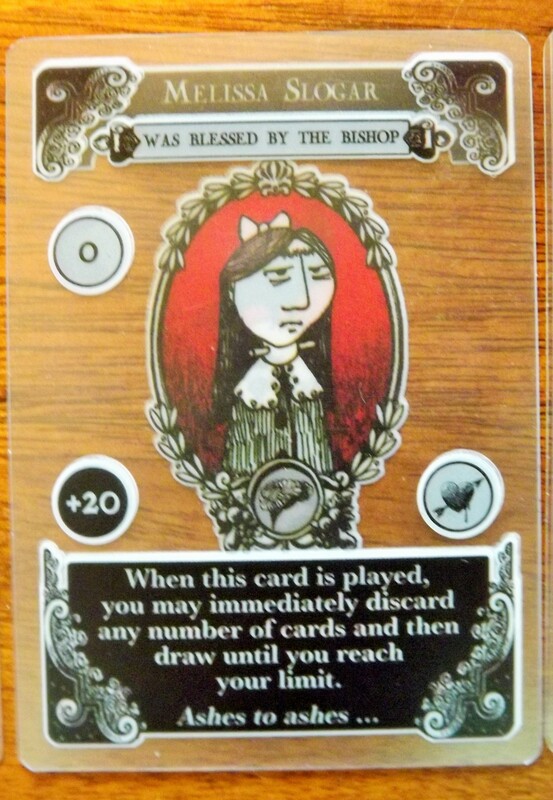 Each time you play Gloom, you will have a different story experience. Random drawing of event cards and each player’s ‘take’ on them will create a unique storyline. This gives the game incredible, entertaining replay ability, making it well worth the price you paid. The two player game results in more direct conflict, but the game really shines with more players. As the interaction increases, the stories get more over the top. I found that with the right group of friends, you will try to outdo each other with your stories in addition to trying to win the game! This does have a drawback, as the game can run a bit on the long side with the increase in players. It can become increasingly difficult to kill off your characters to end the game, which can result in some marathon sessions. The game stimulates your imagination and the combination of the art, text, and mechanics makes for a truly dark and wonderful time. Nothing worse than being wounded by wasps…. You do want to be careful with who you introduce to this game. Some may not like the dark, Gothic theme and if the person isn’t into storytelling, all of the players will suffer. Nothing kills this game more than someone who doesn’t want to participate in crafting their own tale. Throwing down a card and reading what it says ruins the mood and makes everyone playing miserable. And not in a good way. On the other hand, if everyone is into the game and wants to make the best narrative they can, this can lead to some big laughs and enjoyable moments you will talk about for months to come! Everyone is pretty much on an even playing field during this game. There is a small amount of luck when it comes to drawing your cards, but it basically comes down to what you play and when you play it. Usually when the point total on the card is extremely low, there is a handicap in playing that card. The taunted by tigers card has an overall -30 point total, which is great for when you want to kill off your character. However, when you play the card you have to skip your next draw phase. This will leave you at a disadvantage for the next round. There is also a bit of a “take that” element when you play positive event cards on your opponent’s characters. This means that you get to change their stories and then sit back and watch them scramble to incorporate this new element into their tale. It will also force them to use more of their cards before they are able to kill that family member off. There is a strategy involved when playing the positive point cards on other players since when they are played they usually give a benefit. When you play the “landed a legacy” card it gives your opponent a +15 point total, but they also get to draw or discard two cards right away. This can factor into your own strategy near the beginning of the game since you may want to play these positive cards on your own characters to gain the benefits that will help you later on in the game. The game looks fantastic. The cards are a unique see-through plastic which allows them to be stacked on top of one another. It allows for elements from the previously played cards to either show through or be obscured. The artwork has an Edward Gorey feel to it which plays into the theme perfectly, but it is rather sparse. 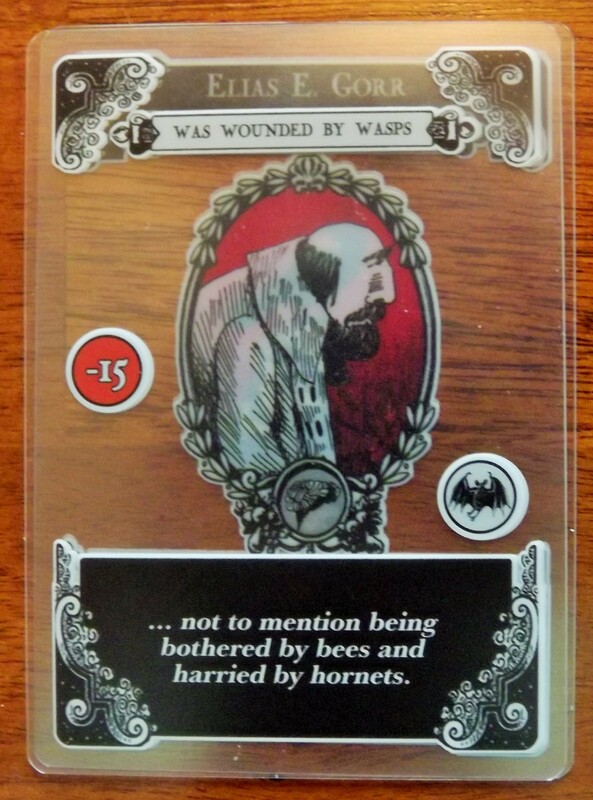 Other than the family cards, the artwork is primarily on the borders and the small modifier icons. The text on the cards is a bit on the small side and on most of the cards it is white on a black background. This can make the text difficult to read in poor lighting and can cause issues when trying to see what cards are played on your opponent’s characters. Since they are made of plastic, they do show smudges and fingerprints easily. A simple wipe with a cloth, will clean them up and leave your cards looking great again. This plastic also makes the cards extremely durable. They don’t bend or tear and can be spilt on with little to no damage to them. In a typical card game you are trying to weaken or kill your opponents while making yours succeed. In Gloom this concept is turned upside down. I get a lot of delight from this game since I have a dark sense of humour and a love of all things macabre. It is an easy little filler that you can bring out and enjoy with your friends. It makes it a perfect fit for me, but I can see how others may not feel the same. It’s a game where your enjoyment is based on how much you are willing to put in. The translucent cards and unique mechanic will only take it so far. The interaction and story telling elements are what drive the game and if that isn’t what you relish, then this one is not for you.